In 2010 I started working with patients suffering from serious illness and pain (Arts Residency, Pain Clinic, Royal United Hospital, Bath). Alongside other visual methods I made live visual notations to capture the content of their felt experiences with pain. 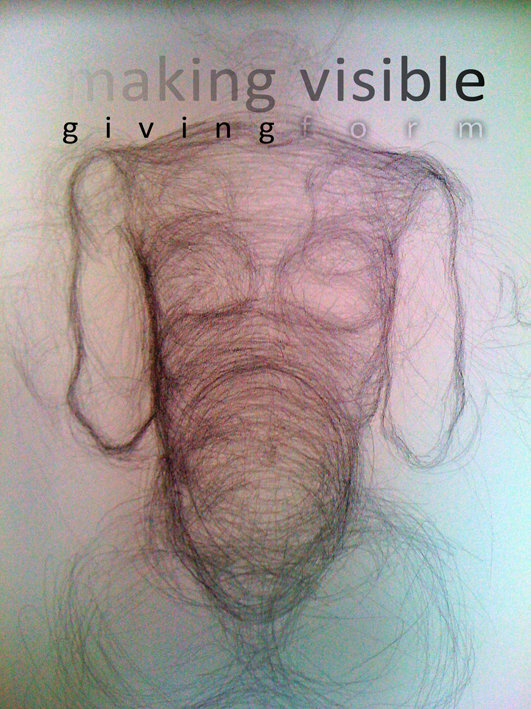 During a series of in-depth interviews, I drew visual notations of what people expressed and told me there and then, in plain sight of the patient, thus creating an external focus on an internal subject. This process of co-creation proved to be a gentle way allowing people to be specific and clear about their inner world of feelings and emotions, and a powerful tool to enhance concentration and aid reflection, thus giving it a delicate therapeutic value. All these visual notations, the shapes and forms, the colours and sizes, the presence of intensely felt experiences endured over long periods of time, difficult to express in words, formed the basic material (data) for a primary analysis. Its outcomes informed the design of a more generic visual communication tool, that offers people an alternative to express and communicate their experiences, both to themselves and with others. The communication of felt experiences visually can inform healthcare professionals in making a choice for (further) treatment for a patient. The visual language leads to another way of understanding and gaining insight in the working of our bodies, the messages it conveys, the meaning of pain, as well as can create a wider understanding for people's suffering. This work informed the development of the design of a visual communication tool, 'SubSurface' : a set of visual exercises, or frameworks, that visualises each an unique aspect of the pain experience. Together these visual frameworks capture, measure and elucidate a wide spectrum of the lived experience. For more information or an informal discussion on this research, visual notation and/or its value, please contact me. The basis for this project is a case study for my MA in Communication Design (2010). The thesis "Envisioning Experiences of People’s Pain” gained a Distinction and the project itself was awarded with the University’s Innovation Award, Bath Spa University, 2010. Paper ‘Beyond Words - Envisioning Experiences of People's Pain & Illness’- at the multidisciplinary Conference on the Concepts of Health and Illness, UWE, Bristol, September 2010. These posters (shown below) are currently displayed in Professor Lorimer Moseley’s lab at The University of South Australia, Adelaide where they are attracting a lot of attention. The originals are displayed in the Pain Clinic of the Royal United Hospital in Bath where they are also attracting the attention of patients and clinicians. 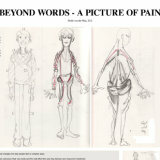 Article ‘Beyond Words - A Picture of Pain’- publication in Pain News, British Pain Society, UK (December 2012). Guest lecturer Bern University of Arts, Communication Design, Switzerland, 2011.